Redmond Municipal Airport or RDM is a public domestic airport, situated in Deschutes County, Oregon, United States of America. Owned and operated by the city of Redmond. 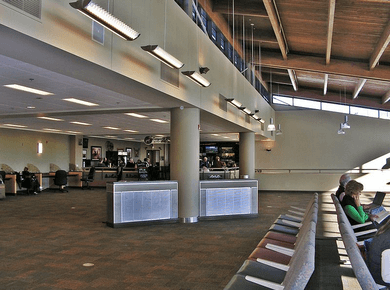 It is the major commercial airport in Central Oregon. RDM provides non-stop regional flights to the western part of United States. The airport is Lancair factory base as well as aerial firefighting aircraft operations home base. Roberts Field handles about 50 thousand aircraft operations and more than 600 thousand passengers every year. Alaska Airlines, American Eagle, Delta Connection and United Express are most popular passenger airlines, while Airpac Airlines, Ameriflight and FedEx Feeder are concentrated on cargo transportation. The airport has one terminal building with two runways and one helipad. Main terminal includes gift shops, pubs and restaurants as well as children play areas, Flybrary zone, rentable conference room and free fast Wi-Fi network. All the facilities work 24/7. RDM Parking includes two huge outdoor uncovered parking lots, just across the main terminal plus Cell Phone lot. Redmond airport parking also has a separate employee parking lot, vendor parking and rental car lot. Both Outdoor parking lots are conveniently places in front of the terminal which makes them very easy to access. Lots are open for business 24/7 making parking at Redmond airport swift and convenient. The Cell Phone lot is a perfect place for those drivers who just came to pick up arrivals and do not want to spend money circling around the airport or paying for a 10 minutes stay. The lot is absolutely free but drivers must remain in the car. All unattended vehicles will be towed away with further expenses. Redmond airport parking rates are similar for all spaces. It costs $1 for 1 to 30 minutes stay; $2 for 31 to 60 minutes stay and $2 for each additional hour. Redmond airport parking Daily Maximum costs $15. You can pay with all the major credit cards or cash by the parking exit. There is also a separate credit card only exit for faster operation. If you’re interested in off-site parking, take a look at Super 8 Redmond Airport Parking, which rates only $5.99 and offers FREE 24-hour transportation & luggage assistance to and from Redmond Municipal Airport. It is located within just 5 minutes of car drive from the main terminal.